Humans are designed to work efficiently but not continuously. After a certain time, our body does not support us and we fail to reflect efficiency in our work. Even now, you might have opened a thousand tabs whilst reading this article. Why is it so? Why is there a need to take a hard earned break at work? A rest break is something which boosts up your mind and soul, energizing them in a positive way. Rest breaks at work/ home are usually called as “tea breaks” or “crib breaks”. They are absolutely important, especially during work hours. This solution is scientifically proven and hence cannot be neglected or looked over. Taking a break helps to prioritize work and segregates them in different levels as well as helps them to be focussed on and keep a track of what has been done until now. In the groove of working, usually ideas keep coming and you never feel bored of what you are doing unless there is a sudden full stop of what has been done until now. What could be possibly done in such situations? A break at such a crucial point of time helps you keep focussed and lead a little more towards being successful and activating your goals. Also, it helps to stretch oneself a little towards being focussed and being to upgrade oneself beyond the productivity zone. Whenever you take a break, you get to relax yourself, you get time to breathe and eventually that reflects on your mind as well as your body. It indirectly helps to retain information of what you have done just now. You get time to ease yourself and that leads to a positive impact on the brain. The information which you have recently acquired and worked upon to make it better can be forgotten in the mind if it is not retained from time to time. Your brain, too, needs polishing from time to time, and hence, breaks gives the brain to send information to the different parts of brain, thus retaining information for a longer period of time. 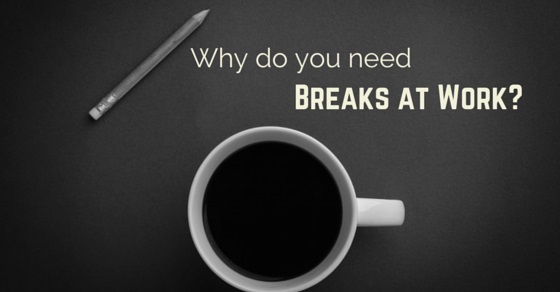 Breaks allow us to rethink over a particular thing for a longer period of time. Breaks are an important aspect in the life of a human. In today’s work pattern, taking a break is way too hard, as most of your time is focussed whilst in completion of your concerned work. Taking breaks is the only secret serum for excelling in the work you do. Breaks do not need any physical exertion or mundane superhero power. They just need your own time for relaxation. Breaks allow us to take few steps back in time and make us realize what we are doing and help us know whether what we are doing is right or wrong. If it is right, then go on with the flow. If not, rethink over it and make it correct. Breaks increases productivity, says researchers. Over a period of time, researchers have indicated that whilst taking a break, you totally drift yourself to another world, where there is no tension and stress and you are at ease. It increases the productivity of individuals who take breaks as compared to those who do not, apparently. It is a belief that the marginal returns or what is expected from an employee reduces automatically when in an 8- hour shift, with the ones who do not take breaks. When a break is being taken, it rejuvenates the mind and soul which in turn, allows the employees to work efficiently and excel in their work. Thus breaks are what keep us going all day long at work. It is a common fact that a mind can inset information of what it is capable of, not too much or not to less. Once it gets overloaded, and if there is more of information trying to come in, the mind gives up. Ultimately, the body and soul also starts giving up. This in turn adds on to the misery of the individual. As there are assignments and deadlines to be met, at such situation a break is the one that can bring peace to the individual’s mind. Whilst at work, you tend to skip meals in the urge of completing your work, which ultimately affects your health, mind and body. A sudden loss of zeal in any job or one’s duties is not a very common sight and neither is a welcoming sign to a thing. Breaks help reduce stress in a positive way and help reduce negative behaviour to a great extent. Whilst at a workplace, if you are working in an institute wherein you have to sit in front of the computer screen for more than three hours a day, you are more likely to be prone to not- so- welcoming bunch of diseases. Staring at the computer screen and sitting in one position for a longer period of time is not at all welcoming and can cause an array of personal health problems as such. According to a recent survey, it has been indicated that a person who sits staring at the LED screen is more likely to develop pain and problems related to the heart to the ones who do not. One has to work for straight 18 hours a day in order to match with the company’s requirements so in such cases, taking a break can do the needful. All you have to do is to try some stretching exercises that will not only leave you out of the computer screen for a while but also, relieve your body from the extra pounds you will gain after sitting continuously for a longer period of time in a day. In some states of a particular country, a break is considered to be a regulatory compliance. People are paid for a particular break. The federal department does not feel it to be mandatory; however, it is not approved by most of the firms. If a company chooses to give short breaks to employees, which would last from 5- 10 minutes, then it is considered to be a paid time. However, this rule differs from state to state and company to company. You need to get in touch with your department in knowing what counts under your company’s name and how breaks are being organized for the benefit and welfare of the company as well as the individual. But mostly, in many companies, to take breaks are compulsory, no matter what comes in the line. Breaks act as stress busters in our work. A break is all you need to boost up your mind and soul from your daily workout to rejuvenate your lifestyle in a different way. Not taking breaks may not affect our work life but it would definitely affect our personal life. We lack to give time to our friends and family as we are tired of working all day without a break. We are neither in a physical or mental state to enjoy our time with others or ourselves. Here is where the saying “health is wealth” comes into action. We work more to earn more, neglecting our health, hunger, sleep, etc. We forget that if our health is hampered then no money can make it right. There may be times when your body says that it is time to take a break; however you tend to overlook it, because of the tension of meeting the deadlines. Taking a break reduces everything of it and you seem to embrace an inner decisiveness in you. You start becoming alert. Most of the time, it is the inner soul that replies to your conscience to be alert and make the best of the situation. Taking breaks may put a hold on your work, but would definitely not compromise with the efficiency and soulfulness of your mind and soul. Previous articleHow to Pass a Competency Based Interview? Next articleHow to Prepare for HR Round Interview?